Slowly, perhaps, but we can point to four quarters of consecutive GDP growth. As the Budget indicated, this doesn’t mean we’re back in the economic powerhouse period of the 1990s and early 2000s—far from it. In fact, we may need to accept those halcyon days may never return, replaced by a new normal. Those believing we need to bounce back to boom levels to be truly out of recession need a dose of post-financial-crisis reality. Lack of boom notwithstanding, we are seeing green shoots sprouting and we must tend to them: new companies are establishing, jobs are being created, and positive momentum is fuelling investment and positive effects in many sectors, from office refurbishment powering construction and real estate, to flight capacity and hotel-bed occupancy boosting tourism. The positive role of the BDA in helping to drive business development and advance our economy over the past year is unmistakable. Our targeted efforts in Latin America and Canada, in particular, were credited in the Budget for yielding growth; our trust and private-client business was also noted for attracting the high-net-worth sphere through competitive legislation; we were also commended for shepherding several new fund managers to the island. We are making inroads on shipping and aviation, too—diversification efforts that are paying off. What will be the long-term impact on Bermuda corporations of compliance initiatives such as CRS [Common Reporting Standard] and country-by-country [CbC] under the Organisation for Economic Cooperation and Development [OECD] BEPS [base erosion and profit shifting] action plan? What will happen if the UK leaves the European Union? Who will win the US presidential election on November 8? And how would either American party’s winner actually affect Bermuda’s fortunes? As the Budget indicated, we can’t control or predict fast-changing geopolitics beyond our borders—the US political landscape has never been more unpredictable, and in the world of corporate best practices and regulation, the only constant is change. As long as we continue to demonstrate Bermuda’s value to the global economy, our jurisdiction can better weather political and regulatory slings and arrows. 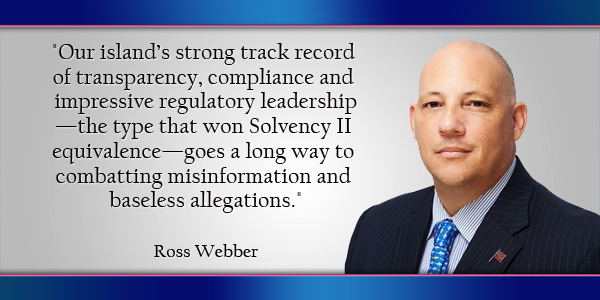 Our island’s strong track record of transparency, compliance and impressive regulatory leadership—the type that won Solvency II equivalence—goes a long way to combatting misinformation and baseless allegations. Add to this the fact that Bermuda companies can demonstrate substantial mind and management, the substance of impressive intellectual capital—and our value proposition is even stronger. Our best strategy to deal with these and other complex challenges is a strength we already have: togetherness. Bermuda’s marketplace has always forged a close partnership between government, industry and the regulators. The same will be true going forward. The Budget promised a consultative process in dealing with external threats such as the CbC reporting of profits under any agreement with the OECD. We believe strongly in such productive synergy and we’ll continue to work very closely with our stakeholders. If there was one core message underlying the entire Budget statement, it was that we’re all in the same Bermuda fitted dinghy. Put a different way, everything’s interconnected. Of course, the same could be said of any nation’s economy—but when you live and work on a 22-square-mile island, the togetherness factor rings louder. Collaboration, mutual respect, working towards common goals: those aren’t simply nice ideas; if we’re going to compete effectively on the world at large, they are absolute necessities. The Budget underscored the relationship of Bermuda with global financial markets. It also made clear the fates of our government and international business sector are inextricably linked. We all depend on a healthy IB sector, on a blue-chip reputation, on Bermuda winning respect from global partners. Unchecked debt, immigration questions, the threat of downgrades by credit agencies, negative anti-offshore rhetoric—these are issues that affect all segments of our economic framework. The next year will thrust numerous challenges in our direction. We can best meet them when we appreciate we are all part of the same whole. As 2016 unfolds, and with it, the many fiscal factors the Budget has laid out for our domicile, the BDA will help Bermuda stakeholders work in unison to do just that. Ross Webber is CEO of the Bermuda Business Development Agency [BDA.bm], an independent, public-private partnership working to attract investment and maintain business on the Island.